Kei Mesuda's Arcanacra was recently updated to version 0.4.0. 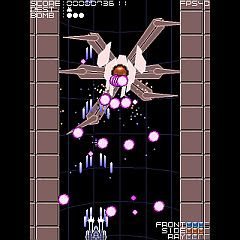 The game is still playable from any plain internet browser with Flash enabled, and comes with six stages in total plus an online high score table. The game suffers from poor frame rate when window size is set to 2x, but works extremely well when the browser window is running in full screen mode with a desktop resolution of 800 x 600. It is possible to upload your own replays for later viewing, or watch replays by any of the top ranked players. Push the right arrow key when the main menu is displayed to view the high score table.